Your child's first few days at The Nursery. Most children benefit from a settling in period; therefore we would ask you to bear this in mind when your child starts Nursery. When your child starts Nursery they will be allocated to a staff member who will be responsible for their care. 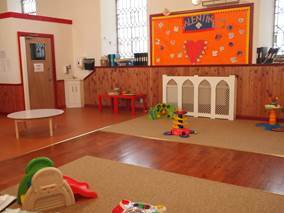 We would suggest that you spend time with your child until they feel secure in the Nursery environment. Staff will be happy for you to sit with your child as long as it takes to settle them. However, if your child is happy to stay, we would suggest you say goodbye to them advising them you will be back shortly to collect them. You can start by leaving your child for short periods. Build up the time depending on your child, the Kindergarten will contact you if the child is distressed. Transition will be made easier if staff are made aware of any special requirements, likes and dislikes. Continue to information on our policies or onto general details.